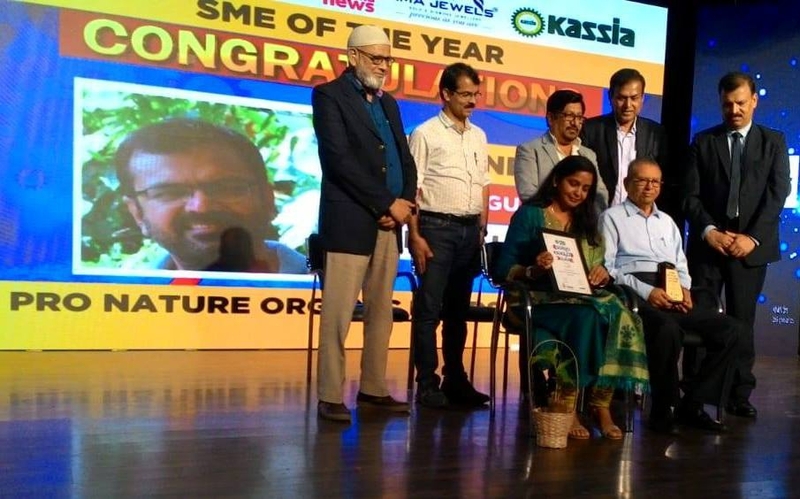 KASSIA, in association with Suvarna News TV Channel and Kannada Prabha, a daily in Karnataka, organized an SME Award event on July 14 in Bengaluru. Women on Wings’ partner Pro Nature Organic Foods Pvt Ltd was awarded SME of the year 2018. Uniqueness of the company, innovations in production and operational process, key achievements, CSR initiatives and performance in the last 3 years, were some of the selection criteria of the awards. The SME (Small & Medium Sizes Enterprises) Awards felicitate small-scale industrialists for their efforts in their respective segments. KASSIA, the apex body serving small scale industries in Karnataka, believes that these awards spur entrepreneurs to strive harder to achieve great excellence and are a benchmark for enterprises of immense achievement and success. The primary objective is to promote the development of small scale industries by co-operating with industrial, business, educational and research institutions and other organizations and help in expanding the business opportunities. Pro Nature Organic Foods Pvt Ltd is a Bangalore based marketer of organic food products. Its vision is to provide healthier food options to the consumers while simultaneously benefiting the producers and nurturing the planet. It is committed to supporting micro-enterprises, especially that of women entrepreneurs and to encourage and help farmers to go organic, thereby building and sustaining a better environment. Since July 2017 Women on Wings and Pro Nature collaborate in growing the social enterprise which will result not only in an increase of revenues but also of the number of female farmers involved.